There is no doubt that if you look around at the world today it can make you very sad. Death, destruction, poverty, hatred and ignorance. Sure things are bad but they are not as bad as we think. Not even close. In fact the entire world appears to be ignorant of just how great things are in comparison to how they were. I have written about some of this before, highlighting child mortality has dropped by 70% since 1970, even though the global population has grown by 30% in that time. 2 billion more people, 16 million less deaths of children under the age of 5. Phenomenal. But that just scratches the surface. Over the last 100 years global incomes per person have sky rocketed and the average life span across the world has improved over the last 50 years. The average lifespan globally today is 70. Almost everything is better including the amount of people who own guitars and this is what I wanted to focus on. There are a number of different ways to measure improvement, through income levels, life expectancy, population growth, babies born per women and culture. The last one is a little complex to measure, but music is a good place to start. 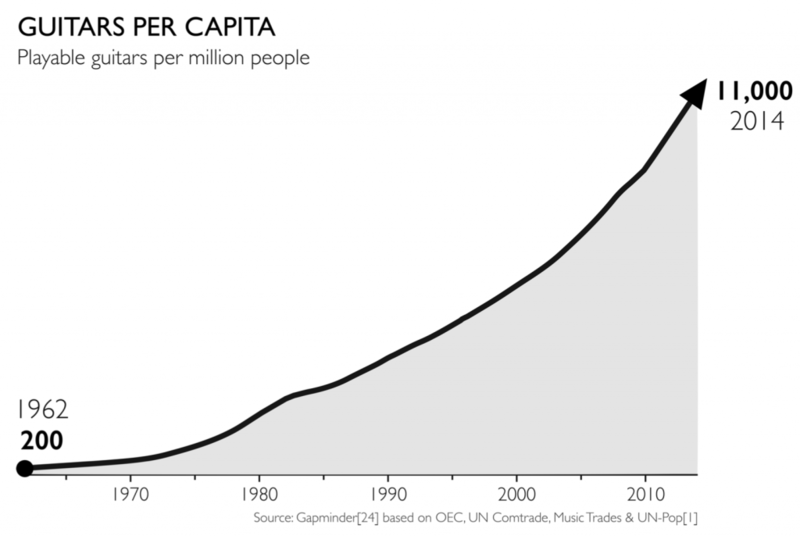 Hans Rosling (my new hero) has data on playable guitars per capita (who thinks of these things? ), and back in 1962 there was 200 playable guitars for every 1 million people, in 2014 that had grown to 11,000 playable guitars for every 1 million people. The increase in income globally has allowed more people to engage in cultural activities like music, being a sign that things are improving. Things are bad in our world, but they are a heck of a lot better than they used to be, they continue to get better, and we are not finished yet.